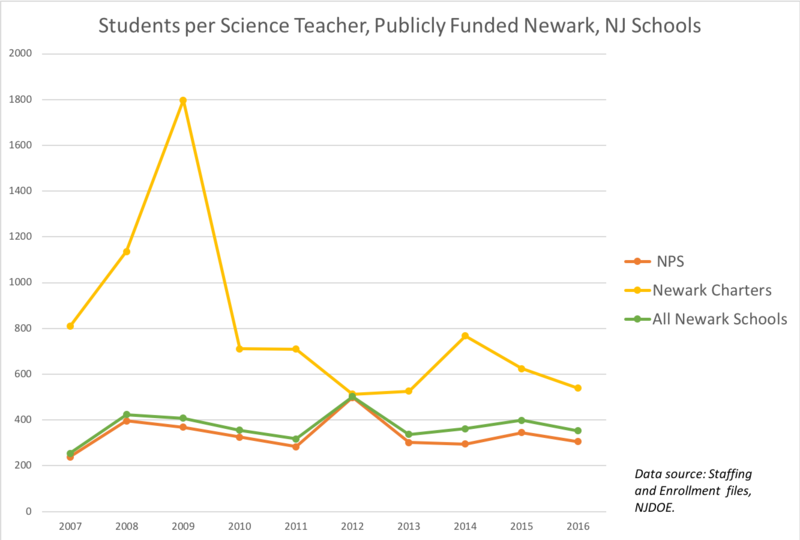 Just a few more thoughts about the recent research Bruce Baker and I did on Newark, one of the most prominent test cases of education "reform" to emerge in recent years. 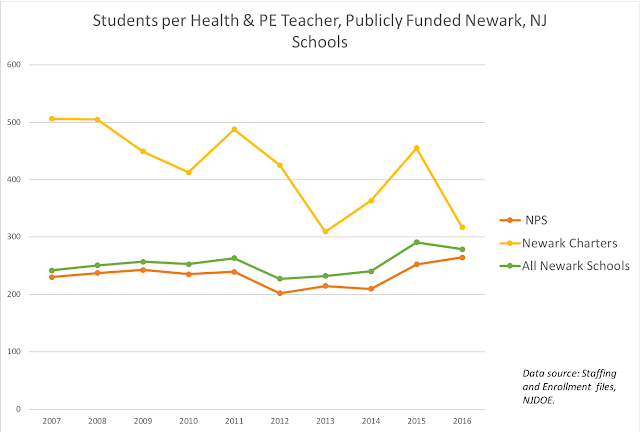 We wrote our research brief, published by the National Center for Education Policy, as a response to recent research by a team of Harvard economists that (to state it briefly) purports to show how moving students from "low-performing" public schools to "high-performing" charters lifted the overall outcomes of students in Newark. 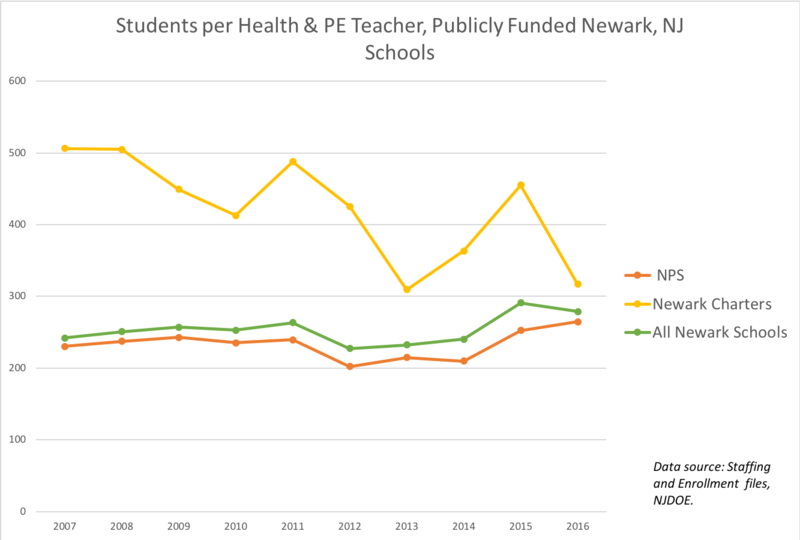 However, as Bruce and I point out: the gains were quite small, they appear to be completely tied to a change in exams (from the old NJASK to the PARCC), and other districts in Essex County, NJ showed similar results. So it's not as if there is much for the supporters of "reform" in Newark, including Mark Zuckerberg, to crow about here. Still, there's an interesting question that arises in studying the Newark "reforms," or any other educational intervention: what, exactly, are the (small) test score gains really indicating? The "learning" that takes place in a test prep environment amounts to little more than pedagogical shortcuts that might increase test scores, but aren't reflective of deepening knowledge. Non-tested subjects -- history, lab sciences, civics, music, art, physical education, etc. -- are given short shrift. As a music educator, the second point is the one that concerns me the most. Charter school marketeers like Eva Moskowitz will tell us over and over how rich and deep her schools' curriculum is ("Chess! We have chess! "), but as I showed last year, the plain fact is these schools do not come anywhere close to offering what affluent suburban schools offer. 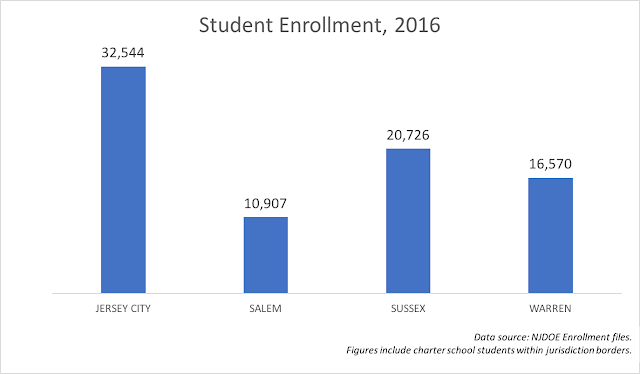 But how do charters compare to their neighboring urban district schools? Do charters sacrifice instruction in non-tested subjects? Do they offer less programming in, say, the arts compared to their host districts -- keeping in mind that arts offerings in urban district schools are often considerably less expansive than those in more affluent communities? I'll be the first to say this is a big topic and the data we have isn't going to give us a definitive answer. But there are clues -- good clues -- that suggest charters may not be putting as many resources into non-tested area instruction as public district schools. Because we can determine the number of staff with particular certifications, and because we know the numbers of students enrolled at a school, we can calculate the "student load" for teachers in different subject areas. This gives us, arguably, an indication of how expansive programming in particular subjects could be. For example: if one school has enough art teachers that each teacher has a "load" of 400 students, we would expect the school to offer more art than a school where teachers have a "load" of 800. So let's look at the data. How, for example, does the deployment of arts teachers compare between the Newark Public Schools and the city's charter sector? 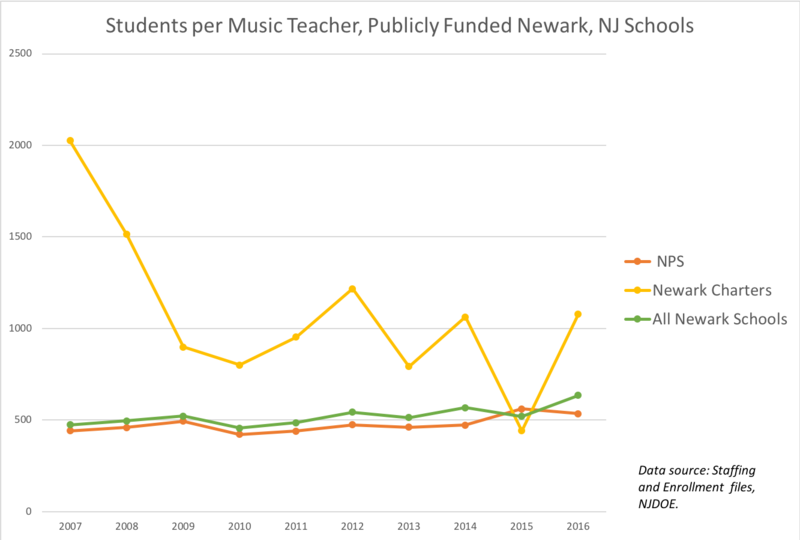 Year after year, Newark's charters provide their students with fewer art teachers per student, compared to NPS. There are some pretty wild swings in the data for the charters (NPS is quite steady). Historically, however, the charter sector just hasn't deployed as many personnel toward teaching art as the public, district schools. Again, there are some big swings. 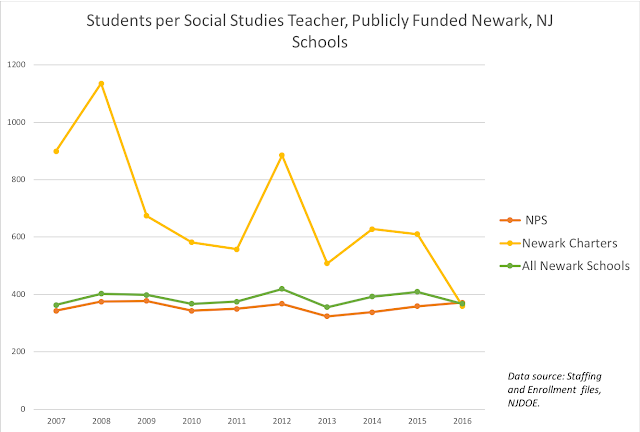 But the general pattern in Newark is that the charter schools historically have tended to deploy fewer teachers per pupil in non-tested subjects compared to NPS. And when you think about it... how could they? Even the largest charter chains -- TEAM/KIPP and Uncommon/North Star -- have small enrollments compared to the size of NPS. Scale issues can make it hard for a charter school to offer all the programming a large school district can. And the mom-and-pop charters just don't have the numbers of kids to justify keeping a full-time music teacher AND an art teacher AND a PE teacher AND foreign language teachers on staff. But more than that: as Koretz points out in his book, the leaders of the big charter chains all admit they place great value on test outcomes -- hell, they've written entire books about it. Doesn't it stand to reason that they'd sacrifice non-tested subject instruction if that meant better test scores? Given their own words, isn't this kind of staff deployment exactly what we'd expect to find? Again: I don't pretend this is the last word on the subject. But I think this is more than enough evidence for charter regulators to start taking a close look at the entire curriculum within these schools. If we really believe that all children should have a rich, deep education in many domains of learning, shouldn't we make sure that schools funded with taxpayer monies are doing just that? * Among other things, getting a certificate requires a certain amount of college-level coursework specific to a subject; for example, I had to have a designated number of credits in music. You also have to pass a subject-specific test, like the Praxis. ** I continue to work on this technique, which I have used before in similar research. Early indications are the grade level a charter serves doesn't have a big effect on these ratios... but this is, admittedly, work in progress. What I show here are the grade-level enrollments each year as a cohort -- the "Class of '17," for example -- passes through a school. This is not student level data; so far as I know, neither NYSED not NJDOE publishes attrition, backfilling, and retention data. Yes, it's possible students are retained, which could make underclass grades larger than upperclass grades. But that raises a series of issues by itself -- is a school keeping students for five years at extra expense to the taxpayers? The data is what it is. But the burden of proof is not on me -- it's on those who makes claims about the effectiveness of certain schools. By now, you've probably heard about the internet prank pulled by cartoonist Ben Ward. Ward tweeted out a completely phony "excerpt" from Michael Wolff's new book about Donald Trump, recounting a made-up story about Trump watching videos of gorillas fighting up to 17 hours a day. What Diane describes here is painfully common in education journalism: some school official or PR hack (these days, usually from a charter school) calls up the op-ed page editor at a news outlet and pitches a story about a school that "beats the odds." The school almost always has some data point they are using to sell their "success." But the editor or reporter almost never follow through and put that data into proper context. What emerges is a story that feels right to folks with reformy predilections, but isn't based on a full and proper accounting of the facts. "Miracle" school stories are like The Gorilla Channel: because people want to believe them, they suspend critical thinking and accept them without subjecting them to appropriate scrutiny. 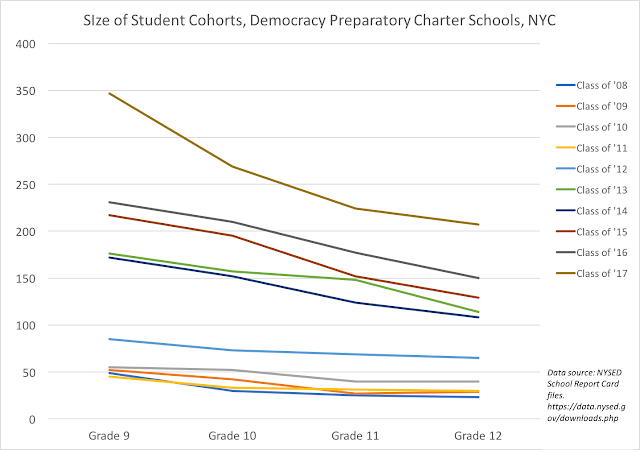 It’s college acceptance season, and if you’re a senior at one of Democracy Prep’s high schools in New York City chances are you are very happy: No charter network has demonstrated more success getting its students into and through college. According to the network, last year 189 of the 195 seniors in its three high schools that had graduating classes went on to college. And although the sample size is small (the network has graduated fewer than 400 students), the network estimates that 80% of its graduates either are still in college or have graduated. Nearly all Democracy Prep graduates are from low-income families. Nationally, less than 20% of high school graduates below the median of household income receive bachelor's degrees within six years. Do you want this to be true? Would it make you feel better if you knew that children from low-income families, growing up in cities whose schools have been under-resourced for years, didn't suffer a penalty in college admissions? Would it make you feel better about our nation's appalling neglect of its most vulnerable children if you could point to a few schools that "beat the odds"? We know there is systemic, structural inequality and racism in America. We know our schools reflect this, and that educational outcomes are influenced by these ugly societal realities. But here's a story that calls these truths into question. How much do you want to set aside your skepticism? Enough to keep you from examining the facts? I am using NY State Education Department data for this analysis. I'll start by aggregating these five schools and asking a basic question: How many students who start as freshmen at Democracy Prep stay until their senior year? This is important: if a school sheds students as they move from year to year, it suggests that school isn't placing all of its students in college -- it's only placing those who stayed for the full four years. What does the data show? 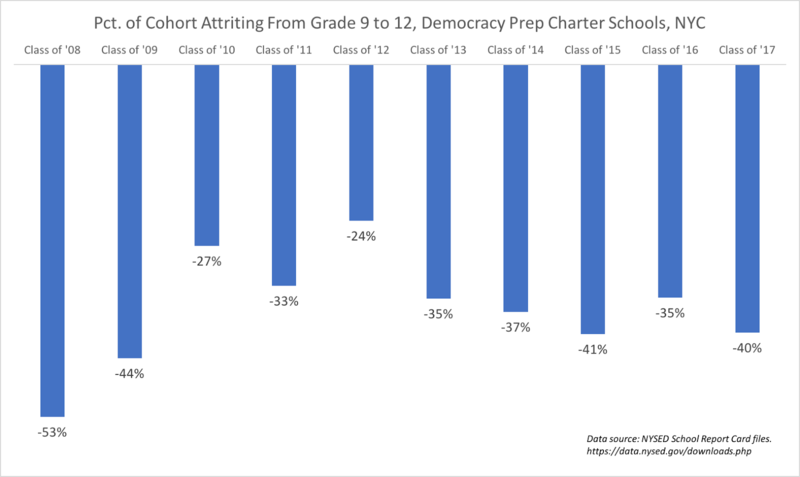 Year after year, Democracy Prep's charter schools shed substantial numbers of students between their freshman and senior year. Democracy Prep only enrolls students who apply to be there? Many students leave Democracy Prep before their senior year? Maybe they do -- but Democracy Prep does not come close to replacing all of the students it sheds from year to year. Did anyone at the News think to check Sahm's claim to see if it was both accurate and put into proper context? Did they think they have an obligation to their readers to make sure that relevant facts were being presented? Did they stop to consider that anyone making a bold claim like Sahm's should be required to subject that claim to rigorous scrutiny? Education journalism in this country is too often shaped by Gorilla Channel values: because newspapers editors and publishers desperately want to believe certain things, they are willing to suspend critical thinking and merely report whatever they are fed. How desperately do you want to believe in The Gorilla Channel? How desperately do you want to believe in "miracle" schools? Are you willing to have a good-faith argument about education policy? Another "miracle school" op-ed, courtesy of The Gorilla Channel! Democracy Prep’s impact is not limited to New York. The network’s high school in Camden, N.J., is graduating its first class this year. All 34 of this year’s seniors have already received at least one college acceptance. This is revolutionary change for a city that five years ago only had three students graduate high school “college ready,” according to the College Board. 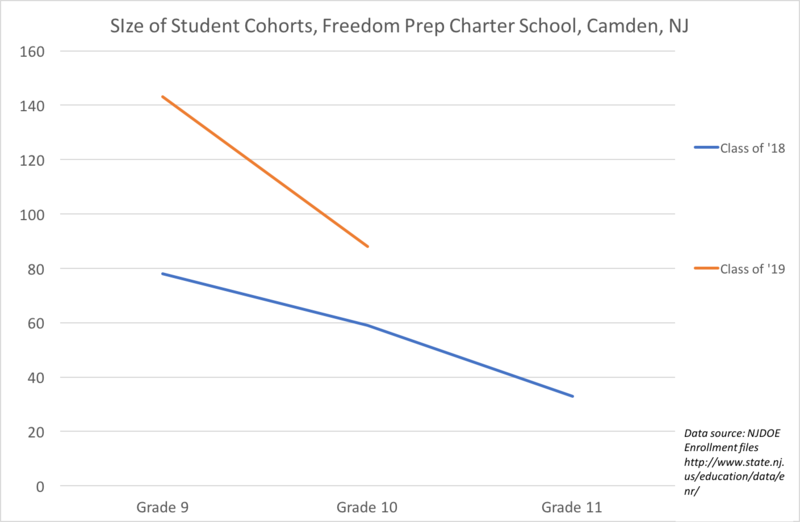 Freedom Prep, the Democracy Prep affiliate in Camden, NJ, has not yet graduated a class. 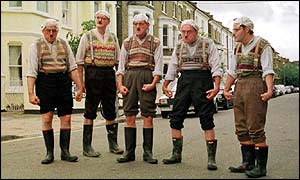 But we can see the cohort sizes up until last year. This year's seniors at Freedom Prep were in a class of 78 freshman. By the fall of their junior year, they were down to 33 students. 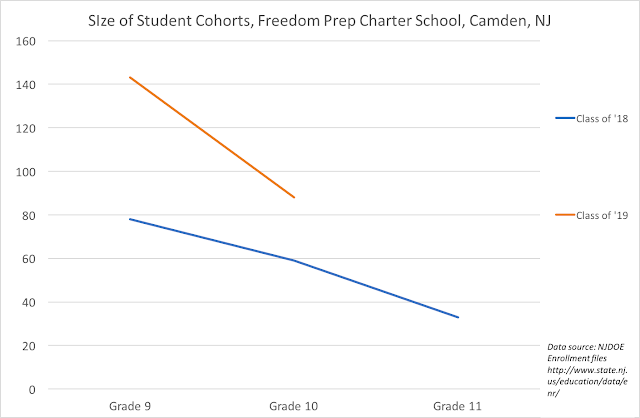 58% of the freshmen of the Class of 2018 at Freedom Prep had left by their junior year. ** Emphasis mine; lightly edited for clarity. I'm thinking about trying to convince @SchlFinance101 to start a School Finance Hall of Shame, where we would regularly acknowledge great feats of public ignorance in the field of education fiscal policy. Jersey City gets more annual state aid than either Salem, Somerset, Sussex, or Warren counties. We'll leave aside the many complex problems with this comparison and ask a very, very simple question: Should a small, sparsely populated county get as much aid as a large, densely populated city? 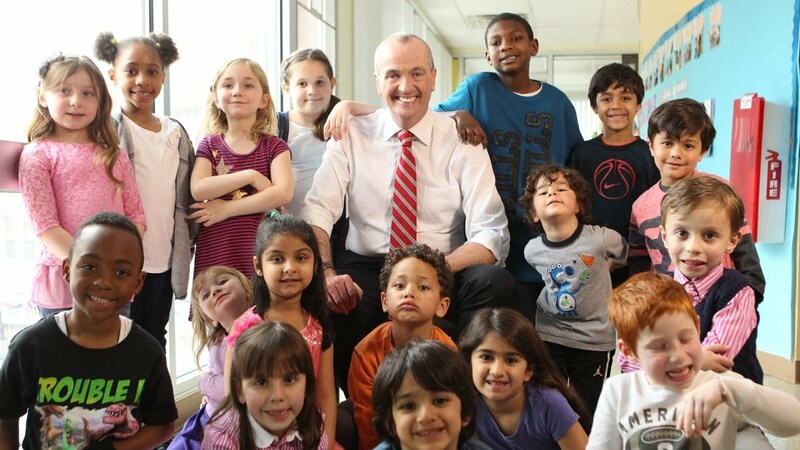 Even if you believe in absolutely insane ideas like "fair funding," where every student gets the same amount of state aid, Jersey City would get more aid than Salem, Sussex, and Warren Counties because Jersey City has more students! I really should stop here - this op-ed, which can't even deal with the most basic mathematical concepts, clearly doesn't deserve any more attention. But let's use this as a teachable moment and dive into another concept that appears to elude so many who opine so loudly about school finance policy -- tax capacity. Imagine two houses that are exactly the same, but located in two different towns. Each house is exactly the same in all details, and each costs the same (in the real world they don't*). One, however, is located in hard-scrabble Palookaville, where it's one of the most expensive properties in town. The other is the cheapest house in Hoity-Toity Village, where McMansions abound. In other words: one house is located in a relatively property-poor town, while one is in a property-rich community. Now, for the purposes of this example, we will do something utterly unforgivable and set aside the tons and tons of research that shows students in greater economic disadvantage require more resources to achieve equal educational opportunity. Instead -- just this once -- we will imagine that each town wants to raise equal amounts of revenue per pupil for its schools. Again, we are setting aside boatloads of research that shows less advantaged students need more resources and, instead, simply imagining what tax rates each town needs to set to get equal funding for its students. 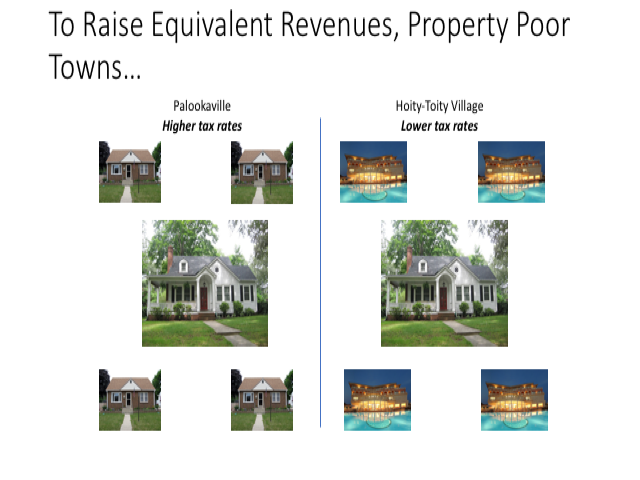 As a matter of basic math, property-poor towns must set higher tax rates to raise the same amount of money as property-rich towns. 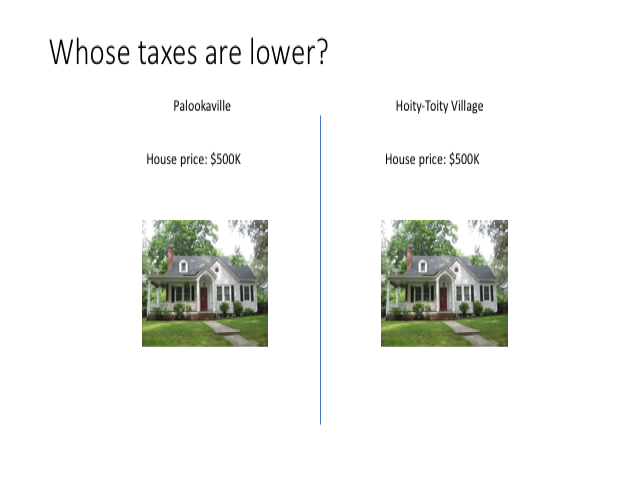 In Palookaville, houses cost $100K on average. 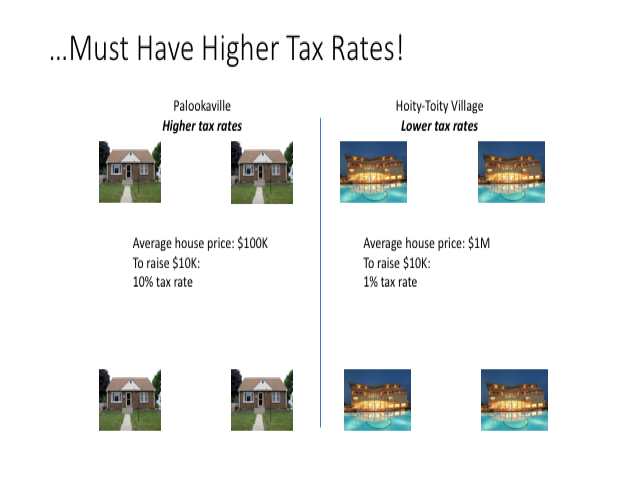 To raise $10K per house, the town has to set a tax rate of 10 percent. But in Hoity-Toity Village, houses cost $1 million on average. To raise $10K per house, they only have to levy a 1 percent property tax. Now let's go back to our two equivalent houses. How much does each pay? 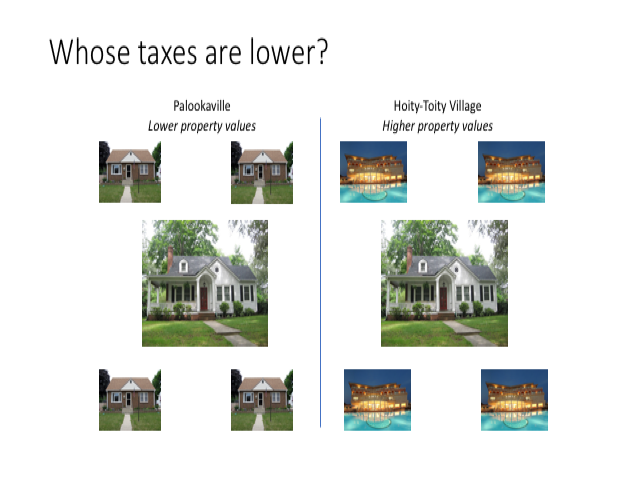 Houses in property-poor communities must pay higher tax rates than similar houses in property-rich communities to raise the equivalent amount of revenue. This disparity is exactly the reason that we have state aid to begin with. If the state didn't step in and try to equalize the different tax bases in communities with varying amounts of property wealth, poor communities would be at a perpetual disadvantage just trying to raise the same amounts of revenue. 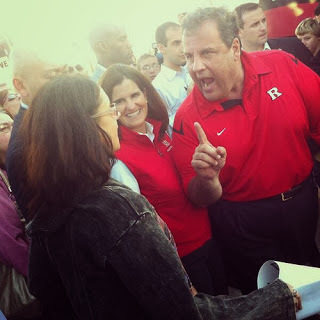 Back in 2016, Ajay Srikanth and I broke this phenomenon down in detail when we critiqued Chris Christie's "Fairness Formula." I wish I could say we were making an original point -- we weren't. Because this is one of the most basic ideas in public policy: Wealthier communities have a greater capacity to generate revenues than less-wealthy communities. If you don't understand this, you have no business opining about... well, anything. 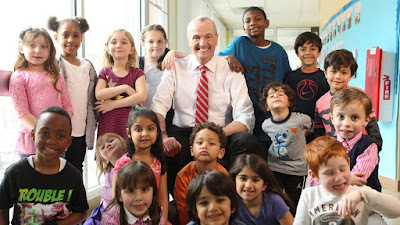 Now, I will be the first one to say that New Jersey, and all other states, should take a hard look at how they determine the taxing capacity of school districts before they implement their school funding formulas. In New Jersey, there is a legitimate argument to be made that some -- some -- communities getting large amounts of state aid should pitch in a greater share of local taxes. But ignorance like this is keeping us from having the serious conversation we need to have. Stop the madness. Sadly typical school finance roundtable. * As one of America's best economists, Leah Platt Boustan, points out, people understand that living in a property-wealthy community can lower their tax rate. So they will pay more for their house to live there. 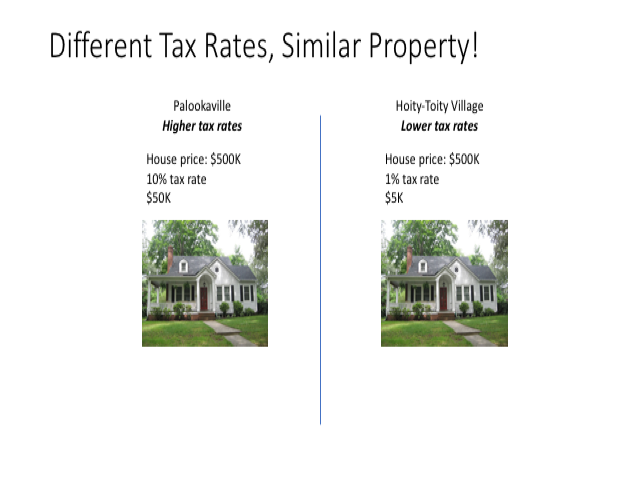 The houses in our example wouldn't cost the same; the one in the wealthy community would cost more. 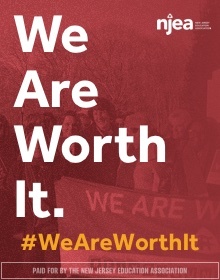 And it would be worth it: better services, lower tax rates.